The Author takes aim with his personal BCM A2 clone wearing a full set of the new Retro Furniture from Brownell’s. With the retro AR-15 craze in full swing, it was just a matter of time before a big name stepped up to the plate and started offering not just retro rifles, but their individual components for sale. So when Brownells announced not only M16A1-style carbines, but also full furniture sets, I was very excited to give it a whirl. As someone who owns a Colt SP1 with original issue M16A1 furniture on it, I was curious to see how well Brownell’s new set stacks up. So I decided to put them side-by-side and take a closer look. Dimensionally, both sets of furniture seem identical. It’s clear that the folks at Brownells either developed these sets based on the originals, or simply used the tech data from the military M16A1 assault rifles. Regardless, they are spot on in terms of size and fit. Left: Brownells repro grip. Right: Colt SP1 with M16A1 pistol grip circa 1971. In testing, the pistol grip fit every carbine and rifle I attempted to install in on, and the stock worked flawlessly on both new production lowers, and original 1970’s SP1 style lowers. 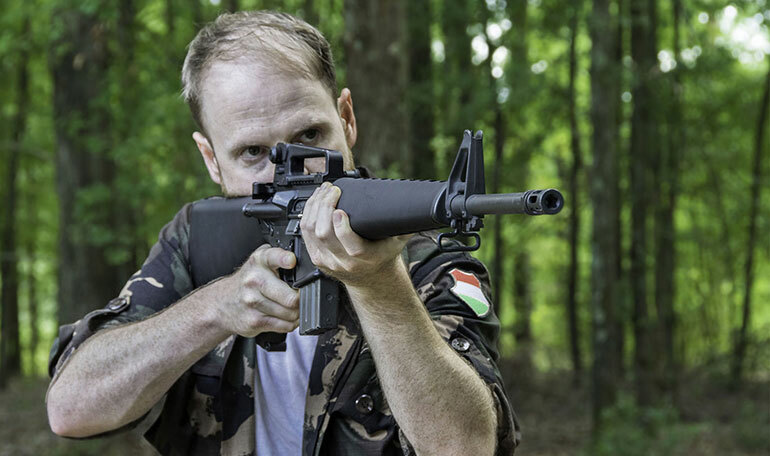 Personally, I’ve always been a tremendous fan on the M16A1 stock, since it cuts one and 5/8 of an inch off the length of pull from the A2-length stock. This might seem trivial to some, but as someone who’s only 5’9”, this allows me to comfortably shoot a fixed-stock AR-15 with my torso squared up to my target. The A1-Length Retro Stock cuts the LOP by nearly two inches on a fixed-stock AR-15. The stock is a mostly realistic reproduction of the original, but it lacks the real rubber buttpad of the original. But given how much more expensive real rubber is than synthetic, this should come as no surprise. 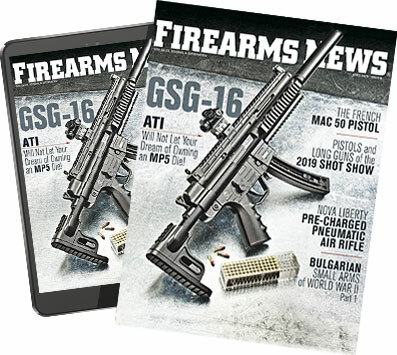 Still, we’re talking about a full-sized rifle chambered in 5.56mm - recoil pads on these guns are the definition of superfluous with no effect on ergonomics at all. Speaking of which, another ergonomic bonus of the A1-type furniture is the removal of the finger shelf on the pistol grip. 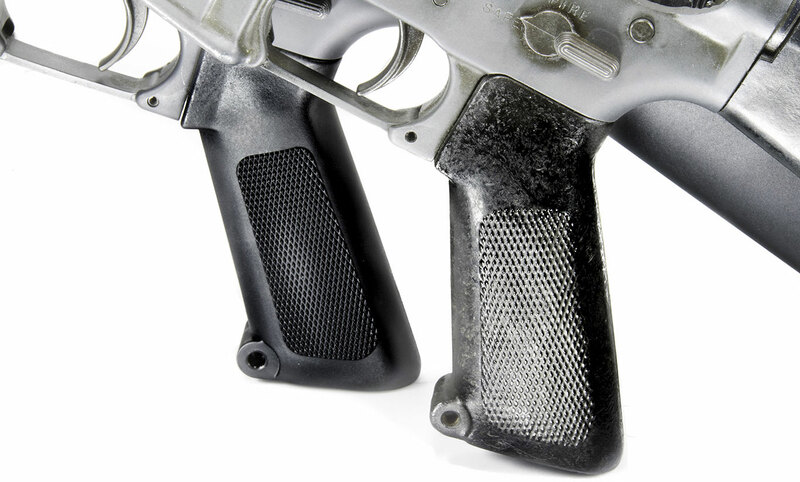 M16A2 clones and most AR-15s made to mil-spec, feature this pistol grip. 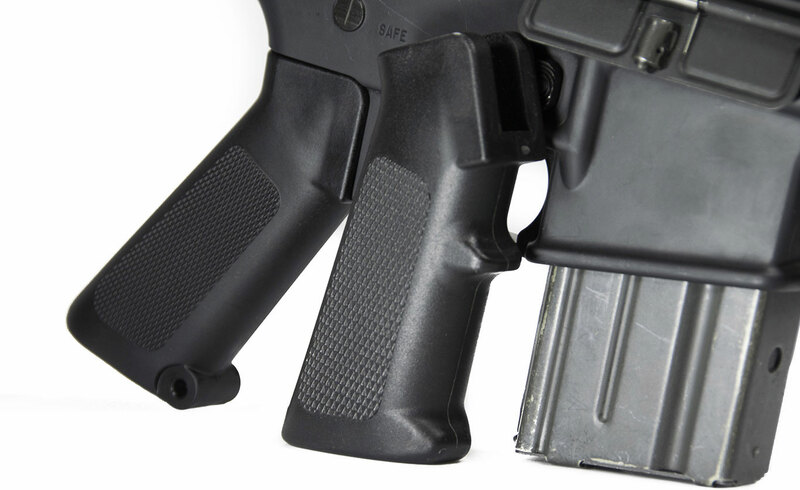 Made from a more durable polymer than the original M16A1 grip, the A2 grip feature an aggressive, “nub” called the finger shelf. The featureless Retro grip is more comfortable to the author than the mil-spec A2 one shown on the right. Like all finger grooves on pistol grips, it works flawlessly for a handful of shooters. The rest of us are stuck with an awkward spot that never feels quite right. Thankfully, the A1 reproduction grip from Brownells greatly improves the ergonomics for both smaller, and larger-handed shooters. Basically anyone whose mitts don’t perfectly fit the A2 grip, will feel much more comfortable with the A1 grip. Which leaves us with the iconic triangular handguards. When the M16A1 was replaced by the A2, one of the areas they changed was the handguards. 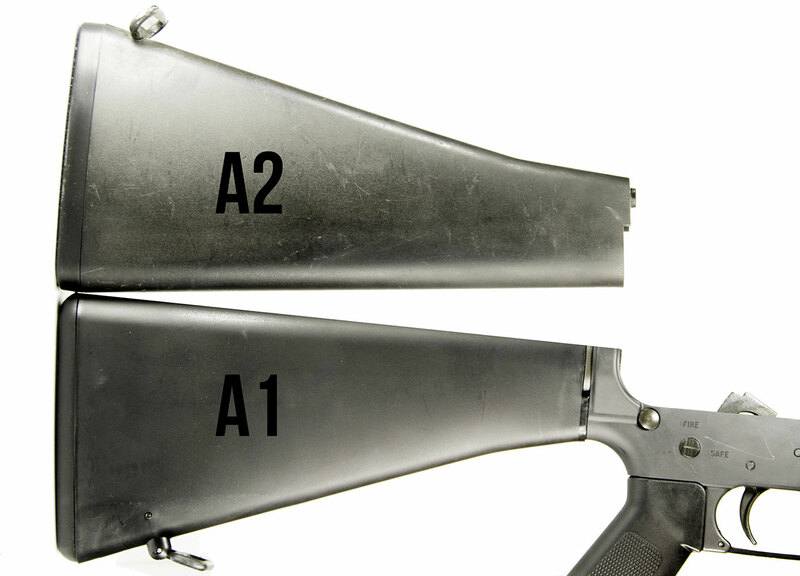 While the original A1 handguards are functional and do a great job of dissipating heat from the shooter’s hands, they have two downsides. While very similar in appearance, the new Retro stocks look cleaner, and lack the scuffs and depth of the older polymer mixture. 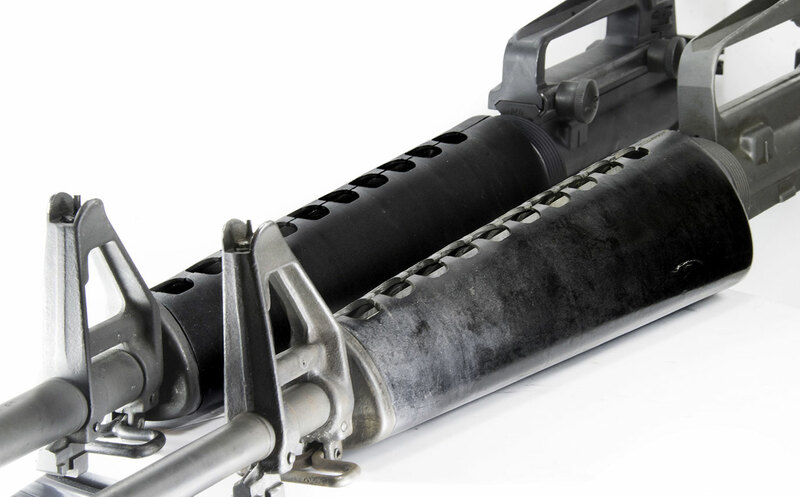 First off, M16A1 handguards are relatively brittle, and because of their polymer’s composition, they become more brittle with time and UV exposure. Second, because there is both a left and right handguard as opposed to symmetrical handguard on the A2,the A2 Unnecessarily complicates supply logistics. But, how does Brownell’s repro stand up? Very well. It looks nearly identical to the original handguards, but also feels vastly more durable. I suspect this is because the handguards, like the rest of the furniture set, is made from the same type of modern polymer as the A2’s stock. While this is great for functionality, it has one downside for collectors: appearance. A Colt SP1 from 1971 next to a modern A4 rifle from BCM wearing the new Retro Stock Set. These modern reproductions look exactly like what they are - modern reproductions. This isn’t a bad thing at all, and the furniture is very functional. But for purists out there who want a flawless aesthetic reproduction, they’ll have to buy the real deal. Problem there, is that authentic A1 stock sets are astronomically more expensive than the very affordable $79.99 price point on Brownell’s set. Plus, Brownells offers their sets in three different colors, so shooters looking for ultra rare brown/tan A1 sets don’t have to sell another rifle to afford one. Overall the new Brownell’s retro sets do a great job of, “scratching the itch” of having a retro-themed rifle or carbine, without having to break the bank to build one. It may have been cheap a few decades ago to scrounge up these old surplus parts, but those days are long gone. For the shooter who loves the aesthetics of the M16A1, but not the price, nothing else on the market is both as affordable and durable.